A rendering the British-sympathizing Bayard family estate, which was confiscated and sold after the Revolution. he first Europeans to settle the area now known as Hoboken were the Dutch. In 1630, via a system of "patroonships" that the West India Company employed to settle its territory in New Netherlands, Michael Pauw purchased the land that would later become Hoboken and Jersey City from the Lenni Lenape Indians who inhabited the region. Pauw had been attracted to the area because of its proximity to Manhattan, which had recently been selected as the capital of the province. Pauw's instincts were correct: almost four hundred years later, the area he chose continues to be prized for its location. He named the area Pavonia, the Latinized version of his name, which means "peacock." Colonel John Stevens bought Hoboken with the idea of turning it into a haven for industry, shipping, and recreation. In 1663, Governor Peter Stuyvesant awarded Hobuk to Nicholas Verlett. His granddaughter married a man named Robert Hickman, who sold the land to Samuel Bayard in 1711. Bayard built a country estate at Castle Point, a high, rocky outcropping that overlooks the Hudson and Manhattan. Decades later, during the American Revolution, his grandson William, a devout Tory, ran into trouble after he joined the British army. 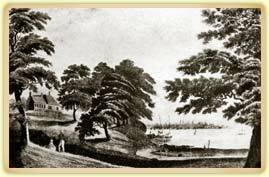 The estate was raided several times and set ablaze by a party of foraging Patriots in 1780. After the war, the Bayard property was confiscated and sold by the government for $90,000 to Colonel John Stevens, who had fought in the Revolution on the side of the Americans. In 1824, John Stevens demonstrated the first working steam locomotive in America (above). Hoboken's view of Manhattan is tremendous (below).